It’s ridiculous. First of all, I challenge any of you to teach a classroom of either nursery school kids for a week or 15-year-old inner-city kids for one week and then ask if you think teachers don’t get paid enough, or teachers get paid too much, which ever your opinion is. But this is more to do with business. All too often online there are people who are teaching everyone how to do things. That’s fine, that’s what the Internet is for; however, many that are teaching you say, especially in the how to make money niche, (just avoid that at any cost, please), but many teach it because that’s how they think they’re going to make money. The reason they come to that conclusion is because they’ve seen someone teaching very effectively, how to make money. They’ve bought the product and they think, because they have watched this person very effectively show them how to do it, they think they know how to do it. They don’t need to bother wasting their time doing it. Why not just teach people and sell a product to them on how to do it? Quite often that’s why you’re buying. Beware. But, teaching online is one of the most fabulous ways to get an audience and to get your audience to love you and to get your audience to think you are an expert and to get your audience to recommend you to their friends and colleagues. That’s what it is all about, getting people, leveraging your customers, your listeners to bring in their audience, upping your own audience. So you had better be good at what you are doing. And oh, if you’re wondering, “Well, who are you, Jon?” Okay, okay, what happened? So I started as a door-to-door salesman, I was on commission only, imagine that, door knocking, commission only; you don’t sell anything, you don’t get paid. Cold calling, no leads, absolute door knocking, winter, snow, rain etc I did rather well. I then started on my own because I figured out why do this for someone else, I was earning money for them, so I figured I would do it on my own, and I earned more money doing the same thing. Eventually I figured this is hard work, and I had better do it a different way. I restarted; picked up service contracts, built up Triangle Fire Protection, sold it for a seven figure sum to Kidde PLC,. Tthey were one of the world’s biggest at the time and then kind of retired just before I turned 40. Then I got bored, got back into it and decided this time customers needed the best way. I started again online and the website started in 2007 — Fire Protection Online,which rapidly grew to a seven figure income, which it still does today and is the largest online-only supply of fire safety in the UK etc etc,. Then build a marketing company showing people how to do it, and I did it again. 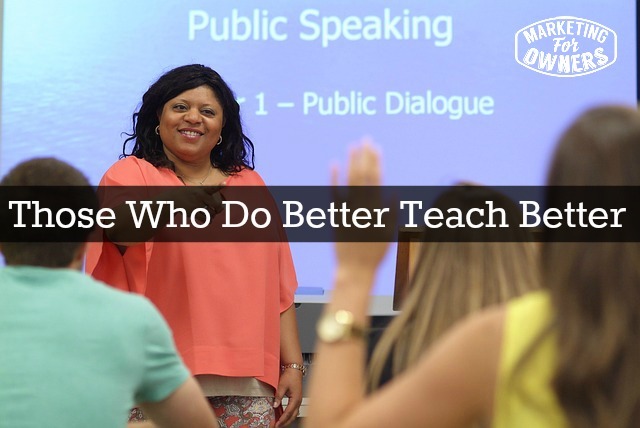 So, let’s talk about those who can teach better. To be able to teach, you need to know how it will work for the person you are teaching. It’s no good theoretical teaching, “If you do this, this will probably happen.” You need to know really what is going to happen, so you can tell them about all of the potential pitfalls, what to look out for, what not to look out for. When I learn from people, what I’m looking to do is I am looking to avoid all the mistakes and pitfalls, I don’t want to waste time learning by mistakes, I want to start half way up the ladder. If I can pick the right expert, follow their system, that’s a good start; I then want to develop it for myself, so I look for expertise; now when I look for expertise, I’m looking for some kind of proof, social proof, Internet proof. I will thoroughly research it, trust me, and research things thoroughly. Anything I bring to you for instance, we will be using; we will be doing such as this. So, this is what is important, if you’re going to teach something, and I recommend you do, when I say teach by the way, it’s not like being a teacher. Make a video online(I use my iPhone 6 on a tripod, on the beach). It takes me about ten minutes, and then I send it off and it gets transcribed. Then I take the transcription and upload it to a Word Press website, and embed it, put the video on YouTube, embed the video on the page, Tweet it, Facebook it, put it on Linked In. Then I give people an option to downloaded the transcript version of my lesson and then they can read at their leisure, until you got about six versions of 10 minutes worth of content teaching a lesson to a willing audience. It’s so easy that even I can do it. So drill into your niche, know everything about what you do, use your experience. So, if you’re a spear fisherman or something like that, tell people what to expect, tell people what happens when you hit the water, tell them not to dip their toe in first to see if it’s cold because it will scare the fish away. Tell them to hold their breath, tell them not to wear goggles because they smash into your eyes, and things like that. Explain from your experience, explain how to keep the spare oil, what is the best oil, what is the quickest way to sharpen the spear, how narrow it needs to be because etc etc and just teach. So remember exactly as I said, those who do better, teach better, all right, learn your trade, teach it. And one other thing, by the way, a little side thing is, by teaching what you know, you actually learn more. I discover this all the time, it’s one of the reasons I do this podcast, it teaches me more and reminds me of the things I had forgotten. I’m excited because today is Wednesday and it’s time for friendly follow. Now the reason I am excited is because this young lady is my favorite blogger and she’s just brilliant. I’ve never met her, she probably doesn’t know me from Adam. Her name is Regina Anaejionu. You have to go and follow her. 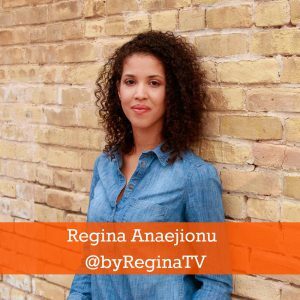 She only started in April 2014, she is fantastic, she teaches things in lessons for free on her blog that others charge $500 for. Go and see, come back, tell me what you think! I will be back tomorrow; I’ll be still on the beach. What can you teach someone?